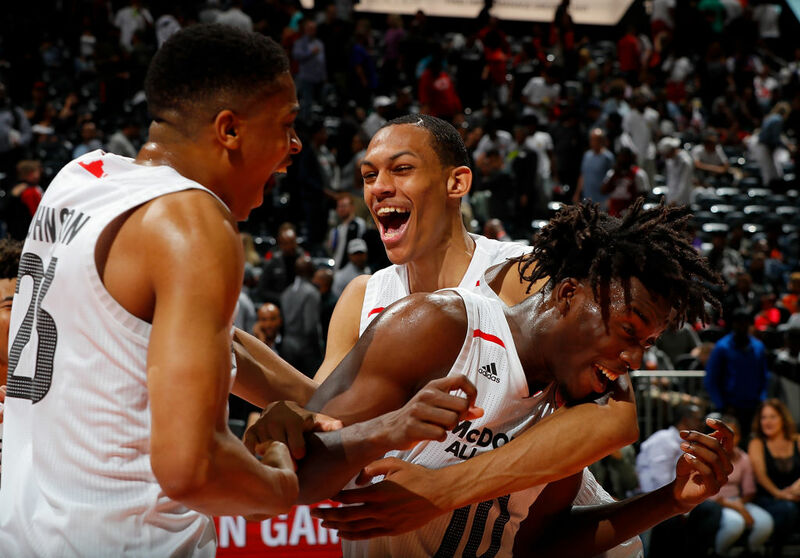 At 6'9″, 210 pounds, Darius Bazley stands out in a crowd. Beyond his physical appearance, though, he's hoping to stand out for another reason. Bazley, one of the top draft prospects in the 2019 NBA Draft, is forgoing college and the G League so he can "intern" with New Balance. In the process, Bazley will make at least $1 million. And if he reaches all of his performance incentives, he stands to make $14 million from the athletic company. This March, Bazley announced he was de-committing from Syracuse. He then planned to join the G League, but that ended up fizzling out, too. Now, Bazley is looking to take a new path to NBA stardom. Bazley signed with agent Rich Paul, who has a long history of representing NBA stars. Paul counts LeBron James, Anthony Davis, and John Wall among his clients. While the G League has made itself more lucrative for promising one-and-done stars, contracts still top out at $125,000 per year. Bazley saw an opportunity for more money with New Balance. Right now, Bazley is training with Memphis assistant Mike Miller. However, the prospect plans to move to the Boston area in January to begin a three-month education in business. He's expected to spend time working with New Balance's marketing department, digital and social media teams, and footwear and apparel design branches. New Balance last marketed basketball shoes about a quarter century ago, when James Worthy was its star athlete. It's hoping Bazley can help lead a resurrection of its brand. Bazley's last real basketball game was more than seven months ago. Unless something changes in 2019, he'll spend more than a year out of the limelight. Could that ultimately hurt his draft stock? Quite possibly. In the meantime, Bazley will get to do something fun that gets him out of bed every morning. It's hard to say if intro college courses would provide the same insight into business experiences that New Balance will. Of course, the NBA is the ultimate goal. And if Bazley succeeds, he could start a new trend across the league.